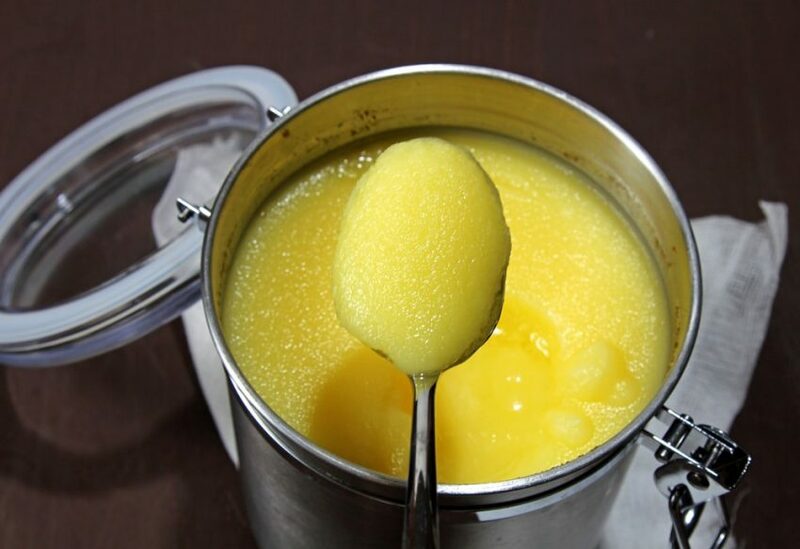 Ghee, or clarified butter, used in many Indian and Ayurvedic dishes. While high-quality commercial brands are the only option for many outside Indian sub-continent, the best ghee is homemade. All you need is fresh butter from cow or buffalo milk and some kitchen essentials. Step 1. Heat butter in a heavy-bottom stainless steel saucepan on medium fire. When butter melts completely, reduce heat to low and simmer liquid. Step 2. Stir at frequent intervals as liquid butter will foam and bubble. The solids start to separate and sink to the bottom of the pan. Resist the urge to increase the heat, as ghee requires a slow cooking process. It will take you about 40 minutes. Step 3. After the second foaming, liquid becomes clear, and gets a rich golden or creamy colour. Solids turn a shade of reddish brown, and your ghee is ready. Remove from the flame. Step 4. Strain liquid into the bowl through cheesecloth placed over the wire mesh. Let ghee cool for 5 minutes before transferring to an airtight jar. Discard the solids. Step 5. Store ghee at room temperature in a dry place for 1-3 months. Use a clean, dry spoon to remove ghee from the jar. My memories of making ghee include a unique, crunchy snack containing the solids. Take a scoop of solids, add 1 teaspoon sugar or maple syrup, and a scoop of wheat, almond or coconut flour. Crumble the mixture by hand and enjoy. Try it the next time you make ghee at home. But, as always, moderation is the key when it comes to fat foods. Woah! I’m really digging the template/theme of this website. It’s simple, yet effective. A lot of times it’s very hard to get that “perfect balance” between usability and appearance. I must say you’ve done a great job with this. Additionally, the blog loads extremely fast for me on Opera. Exceptional Blog!